The KLEIgZero3D (Digital/SPDIF) Interconnect arrived in the same package as the KLEI gZero2D (Digital/SPDIF) Interconnect (previously reviewed), so this review is more about the relative performance of these two excellent SPFIFs. However, discerning the improvements that the KLEI gZero3D Digital/SPDIF Interconnect should be able to provide, based on it's elevated stature in the KLE Innovations product line, was actually not that simple - why?.. even though the KLEI gZero2D may be the more affordable SPDIF of the two in the current KLE Innovations product line, it is far from "entry level", a term normally used to denote the “most affordable" and in general, the "least capable" model in a product line. but, the KLEI gZero2D is an extremely adept SPDIF Interconnect in its own right and capable of competing with many of the very best boutique and esoteric brands already out there. its entry level position has no real bearing on it's actual capabilities. But like all things from KLE Innovations, there's always room for improvement. 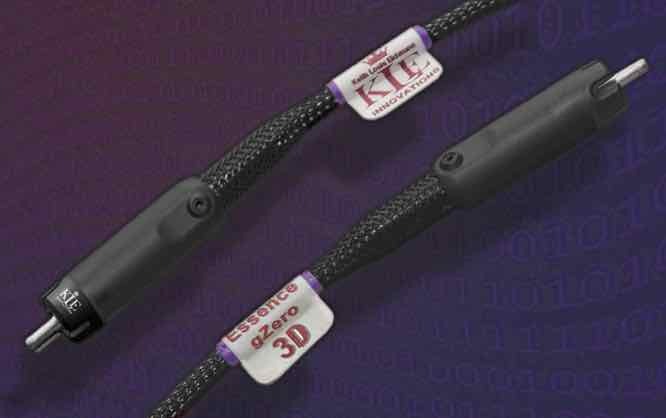 So, how did the KLEI gZero3D Interconnects perform? On initial installation, the KLEI gZero2D lacked the fullness it was to reveal after some 25-30 hours of “settling-in” time, whereas I did not experience that aspect on installing the KLEI gZero3D. From “settling in” onwards, it was going to prove far more difficult to discern why the KLEI gZero3D should warrant my recommendation and why it should have a place in anybody's audio system, over the KLEI gZero2D. The capabilities of both of these cables is extraordinary and initially appeared extremely close, i.e. when installed on my modestly priced system. Perhaps improvements could be more easily observed if the KLEI gZero3D were installed on a system offering higher resolution? But the most appreciable improvement for me was how the KLEI gZero3D interconnects seemed to tear down the walls of the 12' x 15' room where my system is located and transport me into a more appropriately sized venue. On many tracks I could not help but think this is exactly what the sound engineers were listening to as the recording was being made. Laments, Dances and Lullabies, Suite for Guitar, by Miroslav Tadic - the sound engineering on this album is superb and the conveyance of venue's acoustics placed me in a small church, the acoustics of which, matched perfectly to Miroslav’s guitar and technique. I also found that the KLEI gZero3D to have come the closest to conveying the much sought after "analogue feel”, that I have heard from digital music reproduced on a solid state system to date. Well, on reviewing my observations of each individual metric (dynamics, image, clarity, etc...), I found most of the improvements when compared to the KLEI gZero2D, are what I consider to be "marginal”. However, in this case, the "whole" was very much greater than the sum of the parts. Factor in the pricing of the KLEI gZero3D, i.e. being only $100 more than it's more affordable sibling, (an increase of only 40% ) makes it a far more attractive proposition. the cable I tested was already burned in, but it still took a couple of hours to settle before performing its best. Well, I tend to be very pragmatic in my component/cable selection and price plays largely into any recommendation I may make. If you are serious about enhancing the abilities of the digital reproduction components of your audio system the KLEI gZero3D will not disappoint and bring you that much closer to "analogue nirvana"
If your digital components are used more for background music then the KLEI gZero2D may suit your needs better. But you might just find that will change your views on digitally sourced music once you hear them. What has not really been addressed in this review is how the KLEI gZero3D Digital/SPDIF Interconnect compared to other SPDIF Interconnects from other brands. Unfortunately I only have one other SPDIF to compare it to, suffice to say, the other brand did not fare well at all. The KLEI gZero3D Digital/SPDIF Interconnect expands on the very serious capabilities of the KLEI gZero2D Digital/SPDIF Interconnect, providing the most convincing “analogue feel” from a digital source observed to date! Congrat’s again to the guys at KLE Innovations, the KLEI gZero3D Digital/SPDIF IC, just like the KLEI gZero2D Digital/SPDIF IC, is not just a winner, it’s a REVELATION!